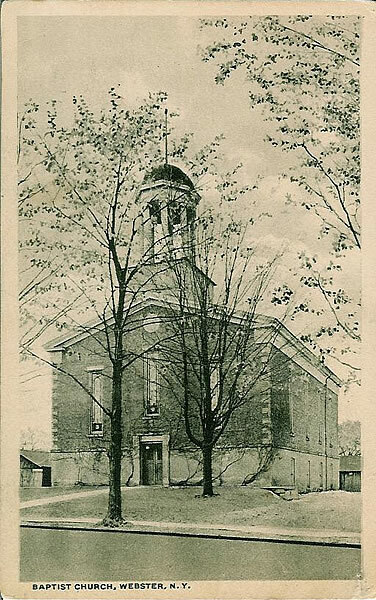 On November 10, 1839, a branch of the Ontario and Penfield Baptist Church had grown to a membership of fifty and was given recognition as an independent church to be named the North Penfield Baptist Church. In 1846, the name was changed to the Webster Baptist Church, following the establishment of the Township of Webster in 1840. A frame building erected in 1832 served the church for over twenty years. This wooden building was then moved one block west to be used by the Webster Academy until it burned in 1872. The present fieldstone and cobblestone structure was built by the 250 member congregation in 1855-1856 and dedicated on January 1, 1857. The following years brought growth and improvements, including a furnace, baptistry, new pews and in 1902, the memorial stained glass windows. Rent was charged for the pews to cover church expenses. The 100th birthday of the Webster Baptist Church was celebrated May 11-13, 1930. A most significant addition in the following years included an Aeolian Pipe Organ, in memory of William and Elizabeth Chapin, installed in 1938. The Christian Education Building was added in 1957, exactly 100 years from the year the cobblestone structure was dedicated in 1857. In 1960, the Edith Bowman memorial gift of the tower lights were installed and have added to the evening beauty of the historic church. During the 1965 restoration, the sanctuary was completely renovated to reflect the Greek Revival features of the rest of the building. At the same time, classrooms and offices were added to the lower level. An elevator was installed on the south side of the church to facilitate access to the sanctuary. The most recent addition was the tower clock which was dedicated on June 5, 1983.